HOUSTON — The countdown to weightlessness begins. On Wednesday (April 9), I got a barf briefing. Today (April 10), I'll get an Army-green flight suit. And on Friday (April 11), I'll finally get a chance to experience life without gravity (albeit in brief increments). I'm here, near NASA's Johnson Space Center, following a team of undergraduates from the University of California, San Diego (USCD) who will perform a biofuel combustion experiment aboard two weightless flights today and Friday out of Ellington Field. The group is just one of a handful of teams participating in NASA's competitive Microgravity University this week. But NASA officials tried to allay the fliers' puke fears during a briefing Wednesday, assuring the passengers that they can choose to receive a pill or injection of an effective anti-motion-sickness drug called scopolamine, and that they can prevent motion sickness by being mindful of their body. An instructional video featuring an anxious flier talking to his therapist provided some tips: Keep your head aligned with your body like you're wearing a neck brace, and keep showing your brain what it expects to see (i.e., your feet underneath you), so that your perception doesn't get inverted. The team gets ready to load their experiment into a ZERO-G plane. another in rocketry club. Most of them are aerospace engineering majors just weeks shy of graduation. Though the experience of weightlessness will be a first for all except the team leader, Sam Avery, the students are much less worried about losing their lunch than losing time in their trials due to some technical mishap. The fliers practiced going through the biofuels experiment process Wednesday afternoon. They even handed over the controls and let me have a go at it. With the turn of one switch and the press of a button, a medical syringe glided forward and squirted a droplet of fuel onto wire crosshairs. Once the little ball of fuel stuck in place, I had to flick another switch and hold down another button to lower the igniter and light the fuel on fire. The idea is to measure the burn rate of four different kinds of fuel. I didn't time myself, but I'm not sure if I'd be capable of doing it all in the 20 to 30 seconds of weightlessness we'll have during each parabola. Luckily, the students are much more efficient at running the experiment than I am. As a recovering liberal-arts major, I'm always wondering how people end up in fields like aerospace engineering. Over dinner on Wednesday, the UCSD students indulged my curiosity. Many of them cited their parents as inspirations. For Joshua Siu, it was seeing the stars over Big Sur during a Boy Scout trip that led him to connect his love of engineering with space. For Andrew Beeler, it was experimenting with homemade fireworks and watching one sputter on its side, realizing he was looking at a rudimentary rocket. For Avery, it was getting a C (a wrongful grade, in his opinion) on a report about the history of the universe and the Big Bang in sixth grade. 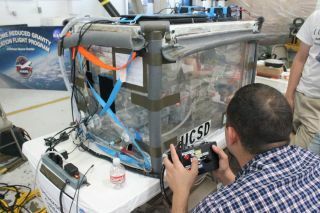 Beeler and his teammates Henry Lu and Victor Hong are set to fly today, testing kerosene and ethanol, two of the four fuels, in their contained experiment box. Friday, the team will test the two other fuels they are using for the experiment. The forecast looks favorable, but parabolic flights are always highly dependent on weather. The UCSD team's NASA mentor, Jessica Tramaglina, a flight controller for the International Space Station, said the plane travels from 20,000 to 40,000 feet (6,000 to 12,000 meters) from the bottom to the top of each parabola. That's a lot of air to clear.